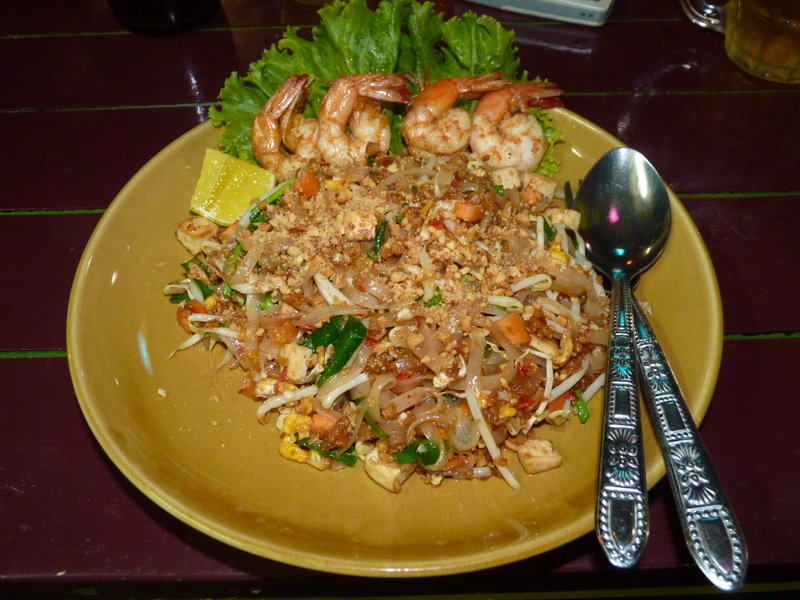 In the attempt to find the best pad thai in Thailand, I have eaten this dish at least once a week since for six months. I am a little shocked that I haven’t gotten sick of it yet. I guess it makes sense; if I were living in Italy, pizza and pasta would definitely be a weekly indulgence. I have had everything from inedible ramen noodle imposters to the most delicious and mouthwatering plates of pad thai you can imagine. For me, pad thai is my Thai equivalent to homemade risotto, pure comfort food. Diving into a dish that, seconds before hitting my mouth, was bubbling from an open flame in a nearby wok is an experience all on its own. It takes everything in me to let it cool down, so I use this time to jazz my plate up with extra peanuts, chili infused vinegar, lime and bean sprouts. 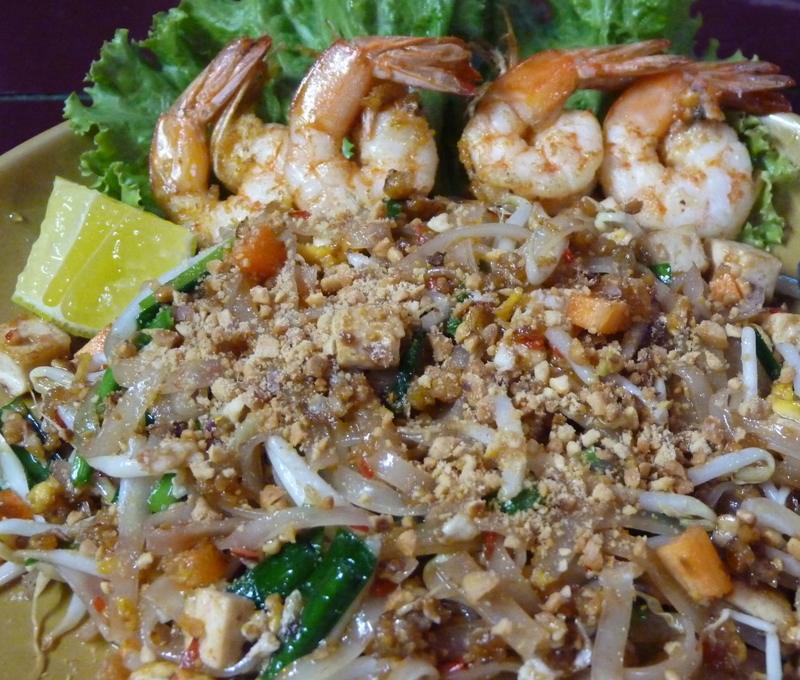 The consistency of pad thai is one that can easily be ruined. Not enough time in the wok leads to crunchy noodles and a thin, watery sauce and a minute too long will leave it dry. Classic pad thai begins with sautéing garlic, shallots, carrot (optional) and tofu in vegetable oil until golden brown. Add the pre-soaked Thai rice noodles to the wok, stirring actively. Next comes the sauce: add tamarind, sugar, fish sauce, and chili pepper until the noodles and sauce are fully combined. Push the noodle mixture off to the side and crack an egg in the wok. Scramble the egg and incorporate it into the pad thai (Not an egg fan? Leave it out). Add green chives and bean sprouts a minute or two before serving. Top your pad thai with peanuts, bean sprouts, chives and a wedge of lime. There are too many amazing pad thai places that I have discovered to name them all, but when I have the craving, a local guesthouse in Ayutthaya comes to mind. 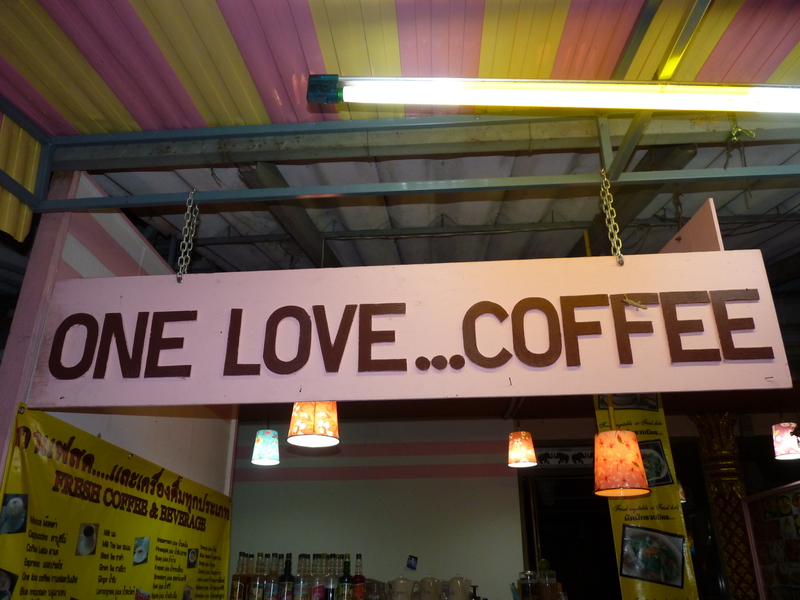 It is hard to walk by ‘One Love…Coffee’ guesthouse and not stop in for at least a drink. The three women who work there love practicing their English and all but harass you until you decide to take a seat and stay a while. The company and a perfect plate of pad thai always has me coming back for more. For a traditional pad thai recipe, I found a great website with step-by-step instructions and pictures for a first timer. Enjoy. pad thai tastes great. 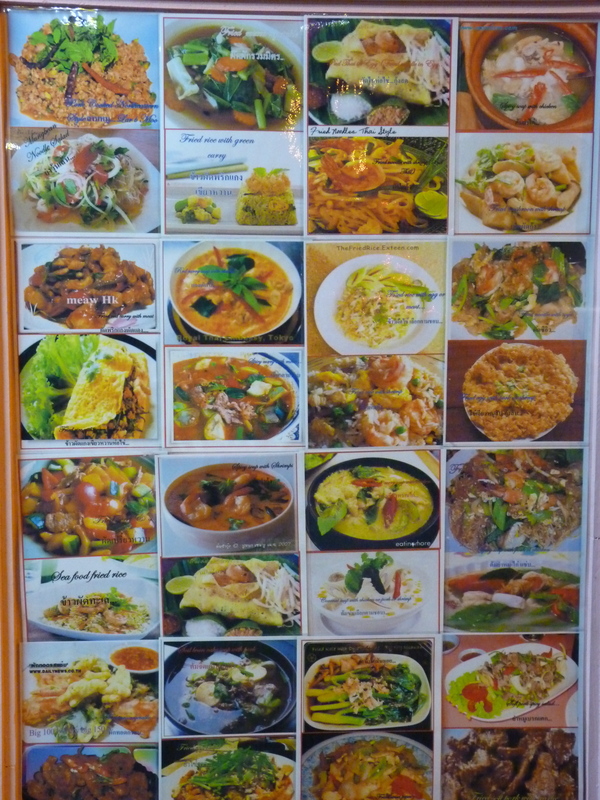 Been in Bangkok for 9 years and eat it on a regular basis. Best thing is to make it yourself becuse most street vendors put MSG in it and that gives me a headache for 3 days. 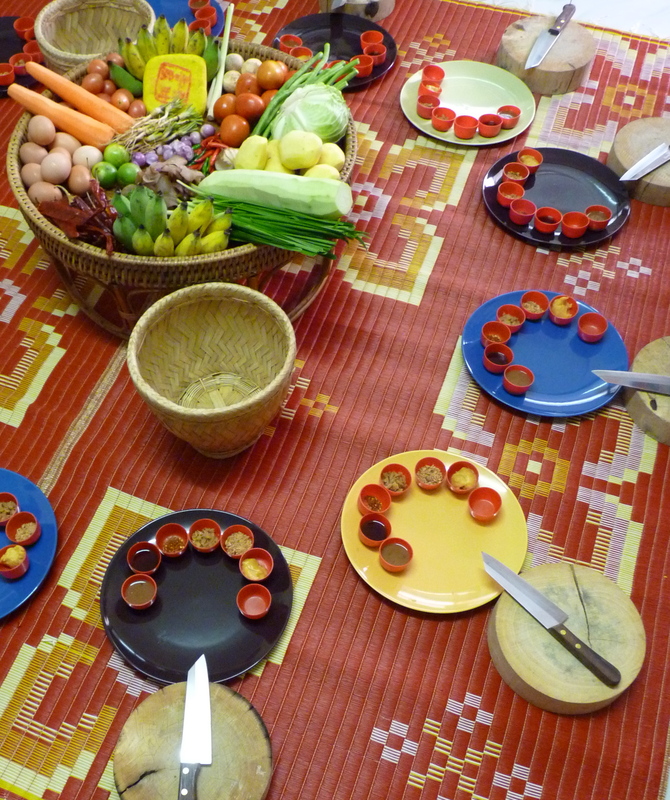 Tom Yam Goong also tastes great – again MSG is the reason to make it yourself instead.